There is a close relationship between an individual’s perception of umami taste and that individual’s physical condition. Our newly developed umami taste sensitivity test revealed the loss of only the umami taste sensation with preservation of the other four basic taste sensations (sweet, salty, sour, and bitter) in some elderly patients. All such patients complained of appetite and weight loss, resulting in poor overall health. We also found that treatment of hyposalivation diminishes hypogeusia, indicating that salivation is essential to the maintenance of normal taste function. Based on these findings, we consider that improvement in salivary flow may serve as a treatment for patients with taste disorders. Umami taste stimulation increases the salivary flow rate because of the gustatory–salivary reflex. We used Japanese Kobucha (kelp tea: tea made of powdered tangle seaweed) to stimulate umami taste and promote reflexive salivation. Improvements were noted in salivation, taste function, appetite, weight, and overall health. Maintenance of umami taste function contributes not only to the preservation of good oral health but also to the general overall health in elderly people. Enjoyment of taste should be one of the greatest pleasures in human life. However, aging is sometimes associated with decreased taste sensitivity. Loss of adequate gustatory function may induce a poor appetite, reduced dietary intake, and weight loss, particularly in the elderly . In Japan, gustatory function is generally assessed using the filter paper disk test, in which a filter paper soaked with a taste-inducing chemical solution is placed on specific areas of the tongue and oral cavity. However, this test only assesses four of the five basic tastes: sweet, salty, sour, and bitter. Because the taste quality of umami, which is recognized as a fifth taste category [2–4], is not clinically assessed at present, information about umami taste disorders has yet to be accumulated. We recently reported the specific loss of the umami taste sensation with preservation of the other four taste sensations in some elderly patients [5, 6]. The patients with loss of umami taste sensation also exhibited poor general health. In this article, we first review our studies, including that of our newly developed umami taste sensitivity test, and related studies concerning taste disorders with particular focus on umami taste disorders and overall health. Second, we examine the link between taste disorders and salivary flow because saliva assists and influences the detection of taste by allowing diffusion of the taste substances to the taste receptors, facilitating chemical interactions with food substances, and protecting the taste buds . Finally, we discuss clinical application of taste stimulation as a remedy for dry mouth-related dysgeusia based on the gustatory–salivary reflex. In our taste clinics, we sometimes meet elderly patients with taste disorders who complain of persistent impaired umami taste, although the other four basic taste sensations are normal. Because of the loss of umami taste, these patients experience appetite and weight loss, resulting in poor overall health. Unfortunately, the currently available clinical examinations result in a diagnosis of normal taste sensation in such patients with impaired umami taste because they have normal thresholds for the other four taste qualities. Umami taste receptors reportedly exist not only in the oral tissues but also in the gut. T1R receptors, which mediate umami taste, are expressed on cells of both the duodenum [8, 9] and tongue, suggesting that the umami taste sensation functions in nutrient sensation and digestion in the gut . This evidence indicates that the ability to detect umami flavors is very important for maintaining a healthy daily life. This is particularly true for the elderly because physiological functions and basic physical conditions decline with aging. Therefore, it is important that we are able to assess and treat umami taste impairment. At present, however, there is no clinical method with which to assess umami taste sensitivity. We recently developed a filter paper disk method using monosodium glutamate (MSG) as a test solution to assess umami taste sensitivity  (Figure 1). We recruited 28 patients with taste disorders (45–78 years of age) and 184 controls without taste disorders (102 young subjects [18–25 years of age] and 82 elderly subjects [65–89 years of age]). Aqueous MSG solutions (1, 5, 10, 50, 100, and 200 mM) were prepared, and filter paper disks of 5-mm diameter were soaked in these individual solutions and placed on three specific oral sites innervated by different taste nerves. The lowest concentration that participants correctly identified was defined as the recognition threshold (RT) for umami taste sensitivity. We obtained five important results: (1) The RT of healthy controls differed at measurement sites that were innervated by different taste nerves; that is, the RT of the anterior tongue (AT) was higher than that of either the posterior tongue (PT) or the soft palate (SP) in both young and elderly individuals (Figure 2). (2) No significant difference in RTs was found between young adult and elderly individuals at any of the three different measurement sites, indicating that our method can be used to assess umami taste sensitivity regardless of the subject’s age. (3) The RT of patients with taste disorders was higher before treatment than that of the healthy controls at all measurement sites. (4) The RT after treatment in these patients improved to the same level as that of the healthy controls. (5) The best cutoff RTs that showed the highest diagnostic accuracy (true positives + true negatives) were 200 mM MSG for the AT and 50 mM MSG for the PT and SP (Table 1). We concluded that our umami taste sensitivity test is useful for discriminating between normal and abnormal umami taste sensations because of the high diagnostic performance of this test (Table 1). Newly developed umami taste sensitivity test using filter paper disk test. Monosodium glutamate was used as an umami taste solution. Filter paper of 5-mm diameter was soaked with a taste-inducing chemical solution and placed on specific areas of the tongue and oral cavity using tweezers. The subjects were exposed to six different concentrations of umami solution: 1, 5, 10, 50, 100, and 200 mM. The lowest concentration at which the patient could detect and recognize the taste was defined as the recognition threshold. Distribution of umami taste sensitivity at the three different measurement sites. Umami taste sensitivity was examined at the three different measurement sites: the anterior tongue, posterior tongue, and soft palate. The subjects comprised 102 young and 82 elderly healthy participants. The x-axis shows the concentrations of the aqueous monosodium glutamate (MSG) solutions (1 = 1 mM, 2 = 5 mM, 3 = 10 mM, 4 = 50 mM, 5 = 100 mM, and 6 = 200 mM). The y-axis indicates the number of participants who correctly recognized the presence of MSG at each concentration of MSG. AT anterior tongue, PT posterior tongue, SP soft palate, AUC area under the receiver operating characteristics curve, PPV positive predictive value, NPV negative predictive value; Diagnostic accuracy = true positives (TP) + true negatives (TN). We assessed 44 patients who visited our clinic with a subjective feeling of dysgeusia using the new umami taste sensitivity test described above. We found that 16% of the patients showed a higher RT only for the umami taste; the RTs for the other four basic tastes were all within the normal range. All patients with an umami-specific taste disorder were >65 years of age, and all complained of appetite and weight loss with resultant poor overall health. Interestingly, the chief complaints of most of these patients were that food was not palatable and that they did not eat normally because of appetite loss . Because all of these patients were elderly, one of the contributors to the development of umami taste dysfunction might be aging. Additionally, most of the patients with loss of umami taste also had systemic diseases (such as diabetes, gastric diseases, and/or depression) and/or oral diseases (such as oral stomatitis, oral candidiasis, and/or oral dryness) and were taking medications. Many of these diseases and medications are known to have side effects of taste disorders or hyposalivation, as described in the next section. After improvement of the patients’ umami taste sensitivity, the patients also experienced remarkable improvements in their appetite and weight because food regained its palatability. All were pleased with the improvement in their health [6, 11]. These results indicate that the umami taste sensation is very important to the maintenance of good health in the elderly. Physiological evidence supports the strong effects of saliva on taste perception . Taste substances should be dissolved within the salivary fluid layer to reach and stimulate the taste receptors during the initial process of taste perception. Additionally, many drugs prescribed for elderly people reduce salivary flow as a side effect. Such drugs include remedies for stomach and bowel disorders, antihypertensives, muscarinic blockers, antihistamines, and antidepressants [13–16]. We examined the relationship between the salivary flow rate and taste threshold to identify how hyposalivation influences hypogeusia in the elderly. 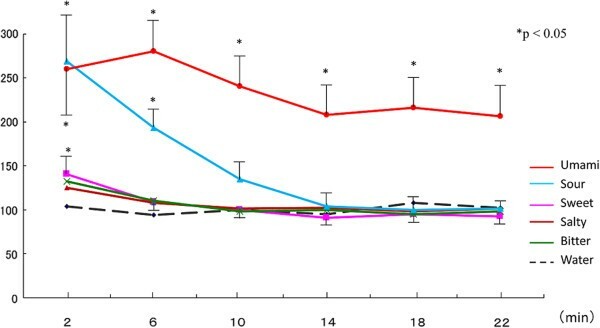 Our study demonstrated that the stimulated salivary flow (SF) measured with the gum test  was significantly lower in subjects with taste disorders than in normal subjects (normal SF > 10 ml per 10 min) (Figure 3). These findings suggest that hyposalivation is closely associated with taste disorders. Moreover, our recent study on xerostomia (subjective feeling of dry mouth) using parameters of the minor salivary gland flow (MF) and SF showed that (1) the MF and SF were both significantly lower in subjects with dry mouth than in controls, (2) there was a positive correlation between MF and SF in controls but not in subjects with dry mouth, and (3) there was a significantly larger reduction in MF than in SF in subjects with dry mouth but not in controls. These results indicate that dry mouth is more closely related to a reduction in MF than in SF . MF might be closely associated with taste disorders because the minor salivary glands are widely distributed throughout the oral mucosa, including the taste buds, and maintain a healthy condition in the presence of elements such as lysozyme, peroxidase, and histatin. Relationship between overall saliva secretion and taste sensitivity in the elderly. 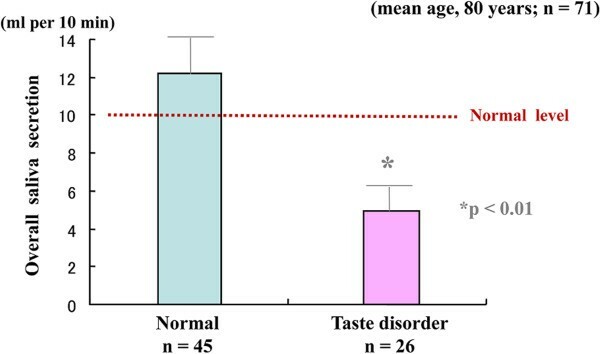 Overall saliva secretion in subjects with a taste disorder was significantly lower than that in subjects with normal taste sensation (p < 0.01). Overall saliva secretion was measured using the gum test (normal level > 10 ml per 10 min). The umami taste is known to induce the gustatory–salivary reflex [19, 20]. We recently examined the labial MF response to the five tastes in 11 healthy male subjects (mean age, 31 years) and found that the order of relative MF responses from highest to lowest was MSG (umami) > citric acid (sour) > NaCl (salt) = sucrose (sweet) = quinine (bitter) . Furthermore, the increase in salivation in response to the umami taste was long-lasting, whereas the increase elicited by sour stimulation diminished immediately (Figure 4). This longer lasting effect of MSG on the reflexive minor salivary gland secretion was similar to the changes observed in the overall salivary secretion (total secretion from the three major salivary glands and the minor salivary glands) . We propose the use of Japanese Kobucha (kelp tea: tea made of powdered tangle seaweed), which is rich in MSG, as a remedy for dry mouth-related hypogeusia. We speculate that the umami substance in our study strongly enhanced the secretion of saliva from the minor salivary glands. This saliva contains abundant mucin, which lubricates the mouth  and maintains a healthy condition of the taste buds. Our clinical data showed that most patients with dry mouth-related hypogeusia were relieved of their symptoms. Thus, umami taste stimulation could be an effective therapy free of side effects in patients with dry mouth and dry mouth-related hypogeusia. Labial minor salivary gland flow responses to the five tastes. 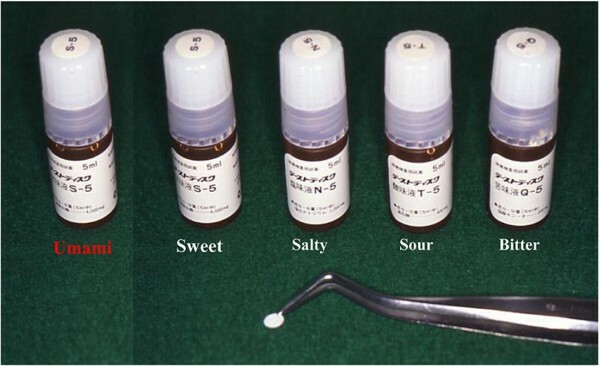 Minor salivary gland flow responses from highest to lowest were monosodium glutamate (umami) > citric acid (sour) > NaCl (salt) = sucrose (sweet) = quinine (bitter). The salivary secretion was expressed as a percentage of the control. Taste dysfunction has a negative effect on health. In particular, loss of umami taste causes deterioration in overall health because of appetite and weight loss. Taste function and salivation are closely related to each other. The sense of umami taste promotes salivary secretion, and saliva strongly influences oral functions such as taste sensation. Thus, umami taste function seems to play an important role in the maintenance of oral and overall health. The present study was conducted according to the guidelines in the Declaration of Helsinki (http://www.wma.net) and was approved by a local ethics committee (the Ethics Committee of Tohoku University Graduate School of Dentistry, approved Nos. 22–21 and 23–23). Written informed consent was obtained from all participants. This work was supported in part by grants-in-aid (Nos. 22590575, 24659931, 24590780, and 25305039) from Japan Society for the Promotion of Science (JSPS). The funders had no role in the study design, data collection and analysis, decision to publish, or preparation of the manuscript. NS, SSK, and TS contributed equally to the manuscript and approved the final version of the manuscript. All authors read and approved the final manuscript.